Houthis Destroy Several Vehicles In Northern Yemen And On Saudi Border (Video) 5 out of 5 based on 12 ratings. 12 user reviews. On March 1, the Houthis media wing announced that Houthi fighters had destroyed four vehicles of the Saudi-led coalition with IEDs in the Khabb wa al-Sha’af district of the northern Yemeni province of al-Jawf. Furthermore, Houthis fighters attacked an al-Jalah military position at the Saudi-Yemeni border in the southern Saudi province of Jizan and destroyed a M1A2 Abrams battle tank of the Saudi Army, according to the Yemeni al-Masirah TV. The media outlet added that Houthi snipers had killed two Saudi soldiers there. The UAE-based al-Arabiya TV reported that the Saudi-led coalition had destroyed nine positions and a vehicle belonging to the Houthis in different areas of the northern Yemeni province of Saada on March 1. One of the Saudi-led collation airstrikes targeted a key position of the Houthis in the Kitaf wa Al Boqe’e district, according to the al-Arabiya. Seven Houthi fighters including a well-known explosives expert named “Qassim Hussain al-Maziji” were reportedly killed. After failing to besiege the Saada province, the heartland of the Houthis in Yemen, the Saud-led coalition stepped up its aerial operations against the Houthis there. Some of this looks ‘staged’ – like why use gas to burn a vehicle that is obviously scrap metal? Smoke draws attention in wide-open spaces like that. Not sure I saw that ‘Abrams’ but I didn’t see any Saudis – and I’m pretty sure those two are more ‘valuable’ than a couple of dead Toyotas. They’ve been doing this since day 1 of the war, you can find hundreds of videos of Houthis doing the same thing everytime they win a battle. 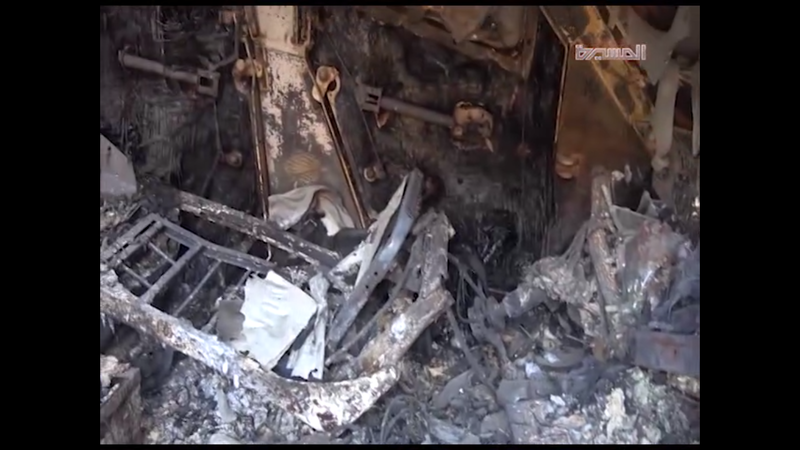 Since they can’t use the equipment themselves, they destroy them in order to prevent Saudis from salvaging them. Dear Mikronos, the Ansarullah (Houthi) military media usually doesn’t show the dead bodies (or heavily censors them) because Youtube (JewTube) then terminates their videos or even worse shuts down their channels. Since the conflict started dozens of Channels of al-Masirah (Ansarullah’s Channel) have been shut down on Youtube. Saudi Arabia also has a massive cyber-propaganda army which targets them. They are still losing the propaganda war though :) . Another reason they don’t show dead bodies is because the Saudi scum and their allies are scared shitless and never leave them, and hence they are burnt……making it even more graphic. I’ve attached a sample graphic picture of the dead bodies https://uploads.disquscdn.com/images/0adb81bd6bcef77fbcc978336e9fb8a823a8a6d44a08594f2543b50f23ff6d32.png https://uploads.disquscdn.com/images/a39d20ee8cdcbdfed01951080f6a50899881027008c7f00482b466bcd92ca480.png of a couple of Emerati scum who got burnt in their armored vehicle due to an Ansar’Allah assault a couple of days ago. Houths are what we call “Lightfoot Milita”, no heavy incumberances, basic food, water, munitions, and rudimentary shelters. And in Houthi case. Good tread pattern on sandals. Not formed as large battle group, their specialty is guerrilla combar, stealth and surprise, pick terrain to their advantage, strike where least expected, strip dead for your needs,; Hit hard, hit fast, and then run like he’ll to safe refuges. Will they make much difference in outcome, not at all. They are no more than pesky flies, cannot realy hold and control landscape outside of small areas and do not have large numbers of replacements for their dead and wounded. While they may slow enemy advancements to some extent, the main holdings of Houthis’ grows ever smaller by the day. While easy to understand their resolve in fighting invaders and treacherous Yemeni allies of Saudis, One should expect no less than such commitment by any one that calls themselves a man. To say one has ideals, while not standing forth in defense of them, then both you and your claim of holding ideals is a lie. LIVE ON HOUTHIS, you are setting example for those who want to form own destiny.